‘With her,’ Therese said. The corner of her mouth went up in a smile. Patricia Highsmith got the idea for Carol (or The Price of Salt as it was named originally) shortly after her first novel, Strangers on a Train was published. She lived in New York at the time, was depressed, and in need of money. She took a job as a sales assistant in a department store and, one day, met a lady customer in a mink coat. The stranger in the store made such a strong impression on her that it gave her an idea for a new book. An onset of fever (from chickenpox) shortly after the encounter helped with the writing. I have no idea if the fever really had anything to do with the writing or whether this is just my impression but the story of Therese Belivet and Carol Aird had a feverish quality that had me hooked from the start and had me lose sleep because I had to know how the story would end. Yes, this was another one of those books where I had to stay up all night to finish it, even though the two protagonists were difficult to like at times. Therese is in her early twenties (I think), stuck in a dead-end sales job, has aspirations of becoming a stage designer, and generally seems to lack empathy for any of the people around her. Carol, on the other hand, is a relatively well-off divorcee who gives off an air of detachment. It is only in the course of their story that we get to see behind the veneer that both characters put up for different reasons - one out of immaturity and one out of a need for self-defence. "‘Crawl in the back and get the gun,’ Carol said. Therese did not move for a moment. Therese did agilely in her slacks over the seat back, and dragged the navy blue suitcase on to the seat. She opened the clasps and got out the sweater with the gun. ‘Just hand it to me,’ Carol said calmly. She reached her hand over her shoulder, and Therese put the white handle of the gun into it, and crawled back into the front seat. The detective was still following them, half a mile behind them, back of the horse and farm wagon that had turned into the highway from a dirt road. Carol held Therese’s hand and drove with her left hand. Therese looked down at the faintly freckled fingers that dug their strong cool tips into her palm. ‘I’m going to talk to him again,’ Carol said, and pressed the gas pedal down steadily." This scene alone is one of the reasons I really want to see the film version and I am miffed that I didn't get a chance to see it at our local cinema. I know that a few readers have found the book slow moving and boring, but I kinda liked the understated pace. It added to the feel of a 1950s road trip into the middle of nowhere, which, I thought, was also an appropriate metaphor for the relationship between Therese and Carol - a journey that lacked company, landmarks, or sign posts. In the Afterword (written in 1989) of the edition I read, Highsmith wrote that she "like[s] to avoid labels. It is American publishers who love them." As mentioned above, after the publication of her first novel, Strangers on a Train, Highsmith's publishers wanted to see her establish herself in the thriller genre. They rejected her manuscript of Carol and urged her to write another thriller. Defying her publisher's request, Highsmith offered to release the book under an alias and sought out another publisher who would to publish a lesbian romance novel that dared to criticise contemporary American society in 1952. Considering that this could have been the end of a writing career that had not even started, yet, and considering that presumably there would also have been some backlash to her personal exposure, I truly admire Highsmith's insistence on getting the book published. The publication itself is not the only break with commercial wisdom that happened with Carol. Highsmith also broke with the convention of how she described her characters as ordinary women, how she re-evaluated the importance of home life and family, and asked the specific question of what price people would pay to even attempt living a life of their own design. 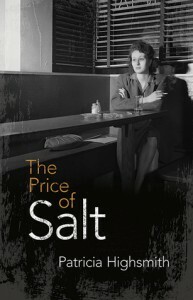 As such, I must admit that I actually preferred the book's original title: The Price of Salt. "In the middle of the block, she opened the door of a coffee shop, but they were playing one of the songs she had heard with Carol everywhere, and she let the door close and walked on. The music lived, but the world was dead. And the song would die one day, she thought, but how would the world come back to life? How would its salt come back?"